Having already announced an impressive array of artist, Imagine Music Festival has set the bar high once again with this year’s festival roster. It comes as no surprise with IMF, now in its fifth year, that some cause for celebration would be in order and with the release of the second phase of their 2018 lineup it’s obvious they pulled out all the stops. With big names like Galantis, Armin Van Buuren, and Zeds Dead already on the list, festival goer’s anticipations were high for phase 2 and Imagine Festival did not disappoint. 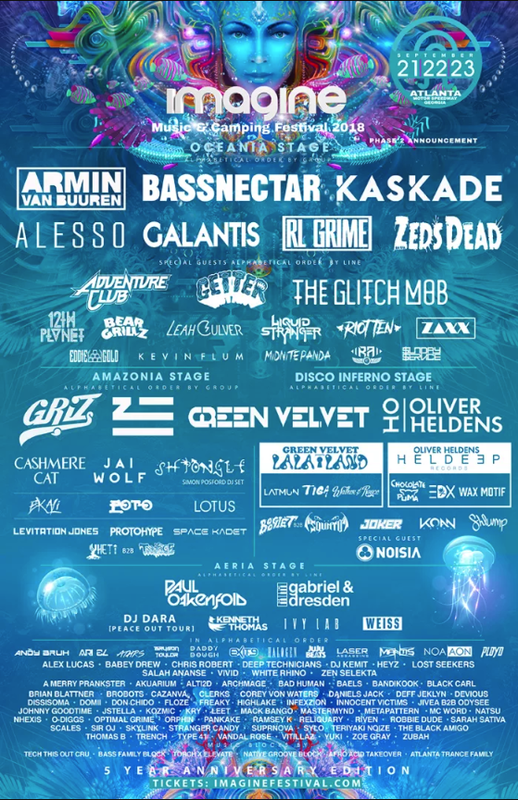 Priding themselves in giving the fans exactly what they want, Imagine has added headliners Bassnectar, Kaskade, and The Glitch Mob to the mix. Having four individual main stages to fill over the course of three magical days and nights, Imagine has also added the likes of Getter, Green Velvet, Boogie T, SQUNTO, Yheti, ZHU, and Tiga. Imagine Music Festival returns to Atlanta Motor Speedway September 21-23. Featuring its signature aquatic theme, Imagine proves to be a one-of-a-kind experience and more than just your average music festival!